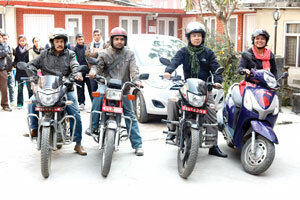 ON THE MOVE: Deepak Kumar Shakya (left) along with members of Kathmandu Association of the Deaf pose with their vehicle of choice. For the last eight years, hearing-impaired Nepalis have been working relentlessly to get the state to change its laws so that they can obtain their driver's licence. However, the government is reluctant to address the issue and doing its best to stall the process. 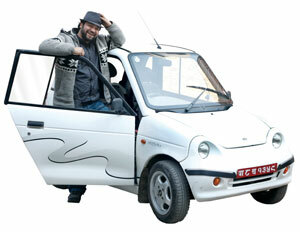 n countries like the US and Japan, the hearing-impaired can drive private and public vehicles. However, Nepal's Motor Vehicle and Transport Management Act 1993 Article 47 prohibits people who cannot hear sounds on the street to drive. "Why are the hearing-impaired denied driving licences, when vehicles aren't even allowed to use horns around schools, hospitals and other sensitive areas? This is outright discrimination," says Raghav Bir Joshi, the only hearing-impaired member of the now defunct CA. Joshi, who got his motorcycle licence 30 years ago and his car licence in 1996, used to drive his own car to the CA meetings and is leading the movement for deaf drivers. "When hearing-impaired people get behind the wheels, our entire focus is on driving and we use the rear-view mirror frequently, which decrease the likelihood of accidents. I have been driving for the past three decades and have had no mishaps so far," he explains. Shrijana Singh, the first female deaf driver in Nepal, started driving after seeing the hearing-impaired in Sweden driving. Like Joshi, she hasn't had a single accident in the last three years since she started riding her scooter. Although national law forbids issuing licences to the deaf, Nepal signed the UN's Convention on the Rights of Persons with Disabilities in 2010 which calls for countries to guarantee fundamental rights of the disabled and treat them equally at all times. To avoid addressing this paradox, the state is pushing the campaigners into a bureaucratic maze. They are sent from one government office to another. Officials make promises to grant licences when there are 'safer' roads and better services. But the assurances are mostly just lip-service. In 2006, a petition requesting the government to repeal Article 47 finally reached the cabinet after years of passing through administrative loops. But since the cabinet did not consider it a 'priority', the file was promptly returned to the Ministry of Labour and Transport Management (MoLTM) and eventually misplaced. In August last year, Deputy Attorney General Prem Raj Karki sent a letter urging the ministry to provide better road signs, hearing aids, and 'special' mirrors for the hearing-impaired so that they can get their licences. However, Anil Gurung, under-secretary of the MoLTM argues the demand for licences cannot be met because it is against the law. In the absence of state support, the hearing-impaired have learnt to use loopholes in the driver license test to their advantage. Since an applicant only needs to disclose her blood group and the trial examinations do not test speaking or hearing abilities, sometimes its easy to 'pass off'. At other times, a deaf candidate's chance of being granted or denied the permit is entirely dependent on the mood of the officials. Problems arise when deaf people have to renew their licences. Deepak Kumar Shakya, president of Kathmandu Association of the Deaf, obtained his licence long after he actually started driving. But when he went to renew it after five years, officials seized his license and told him deaf people couldn't drive. Shakya has now resorted to driving without a licence, which could land him in a legal mess if he gets caught. Babukaji Sherpa has also been driving without a license since it was confiscated in the same manner. Sushil Karmacharya, 30, who has US and Nepali licences, says the government refuses to give permits to the hearing-impaired because it assumes disabled people have no skills or capabilities and thinks they are useless. Unless this attitude changes, Karmacharya feels it will be hard for the community not just to obtain driver's licences, but also to make real progress. Ten percent of Nepal's population is disabled. What are the others doing to help? I don't think 'not able to hear sounds on the street' is a valid reason to prevent the hearing-impaired from getting their driver's licences. If you've driven around in the Valley, you will realise that most vehicle owners blow their horns without any purpose: the road ahead is clearly blocked, but they still feel an incessant need to press the horn and annoy everyone.These traffic noises do nothing to improve on-road safety. If the hearing impaired an pass their practical exams, then they should be given licences.